Leading Exporter of hepcinat lp ledipasvir 90 mg and sofosbuvir 400 mg tablets, ledviclear ledipasvir 90 mg and sofosbuvir 400 mg tablets, myhep lvir ledipasvir 90mg sofosbuvir 400mg, resof l ledipasvir 90mg sofosbuvir 400mg, cimivir l ledipasvir 90mg sofosbuvir 400mg and novisof l ledipasvir 90mg sofosbuvir 400mg from Ahmedabad. 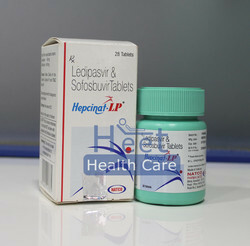 Hepcinat-LP is a tablet containing two antiviral drugs (Ledipasvir and Sofosbuvir) that together work as a direct-acting antiviral agent that interferes with hepatitis C virus (HCV) replication. This is used to treat patients who have contracted genotype 1 HCV (the most common subtype in the US and the UK). Each pack of Hepcinat-LP contains 28 tablets, with each tablet containing Ledipasvir 90mg + Sofobuvir 400mg. Follow your doctor’s orders exactly, including how much to take, any other drugs to be taken along with it, and when and how often to take it. Each tablet can be swallowed with a glass of water. Hepcinat-LP is generally well tolerated, with very few side effects and most of them mild and temporary. The most common side effects of Hepcinat-LP are headaches and tiredness. If you this you are having an allergic reaction to Hepcinat-LP, notify your doctor immediately. Signs may include rash, hives, excessive itching, unusual difficulty breathing, tightness in your chest, or swelling of the mouth, face, lips, or tongue resulting from the use of Hepcinat-LP. You must not take Hepcinat-LP if you are allergic to ledipasvir or sofosbuvir or if you are already taking a medicine containing sofosbuvir. Before taking Hepcinat-LP you should advise your doctor of the following. Taking Hepcinat-LP in these cases could involve some risk or stop the medicine from working as intended. Some medicines can interact negatively with Hepcinat-LP. WHAT IS THE PRESCRIBED USE OF LEDVICLEAR TABLETS? WHAT ARE THE POSSIBLE SIDE-EFFECTS OF LEDVICLEAR TABLETS? 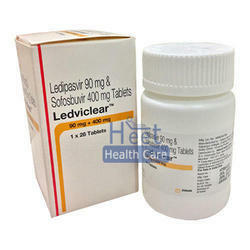 WHAT IS THE IMPORTANT SAFETY INFORMATION OF LEDVICLEAR TABLETS? To make sure Ledviclear is safe for you, tell your doctor if you have a history of hepatitis B; liver problems other than hepatitis; a history of liver transplant; kidney disease (or if you are on dialysis); HIV or AIDS. MYHEP-LVIR is a combination of two hepatitis C virus (HCV) antiviral drugs in a single form. Each single tablet contains ledipasvir and sofosbuvir. 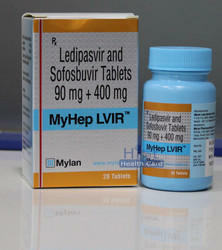 MYHEP-LVIR is a combination of ledipasvir and sofosbuvir and is used to treat chronic (long-lasting) hepatitis C, a viral infection of the liver. It may sometimes be used with another antiviral medication (ribavirin). These drugs work by reducing the amount of hepatitis C virus in your body, which helps your immune system fight the infection and may help your liver recover. 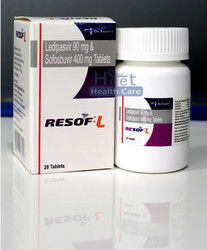 RESOF L is a combination of two hepatitis C virus (HCV) antiviral drugs in a single form. Each single tablet contains ledipasvir and sofosbuvir. 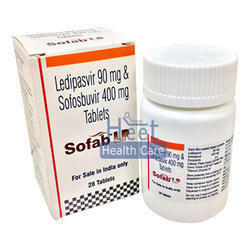 RESOF L is a combination of ledipasvir and sofosbuvir and is used to treat chronic (long-lasting) hepatitis C, a viral infection of the liver. It may sometimes be used with another antiviral medication (ribavirin). These drugs work by reducing the amount of hepatitis C virus in your body, which helps your immune system fight the infection and may help your liver recover. WHAT IS CIMIVIR L TABLETS ? 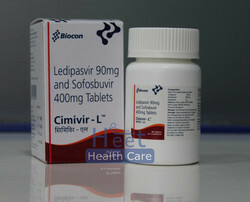 Cimivir L Tablets is a combination of two hepatitis C virus (HCV) antiviral drugs in a single form. Each single tablet contains Ledipasvir 90 mg and Sofosbuvir 400 mg.
WHAT IS THE USE OF CIMIVIR L TABLETS ? It is used to treat chronic (long-lasting) hepatitis C, a viral infection of the liver. It may sometimes be used with another antiviral medication (ribavirin). These drugs work by reducing the amount of hepatitis C virus in your body, which helps your immune system fight the infection and may help your liver recover. WHAT ARE THE POSSIBLE SIDE-EFFECTS OF CIMIVIR L TABLETS ? WHAT IS THE MAJOR SAFETY INFORMATION FOR CIMIVIR L TABLETS ? · Before taking Ledipasvir/Sofosbuvir, tell your doctor or pharmacist if you are allergic to either of the drugs; or if you have any other allergies. · Before using this medication, tell your doctor or pharmacist your medical history. · It is unknown if this medication passes into breast milk. Consult your doctor before breast-feeding. NOVISOF L is a combination of two hepatitis C virus (HCV) antiviral drugs in a single form. Each single tablet contains ledipasvir and sofosbuvir. 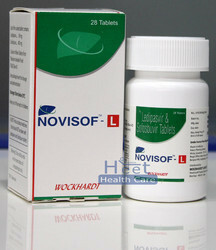 NOVISOF L is a combination of ledipasvir and sofosbuvir and is used to treat chronic (long-lasting) hepatitis C, a viral infection of the liver. It may sometimes be used with another antiviral medication (ribavirin). These drugs work by reducing the amount of hepatitis C virus in your body, which helps your immune system fight the infection and may help your liver recover. Ledifos is a treatment for chronic hepatitis C, particularly genotype 1. It is a combination of two different antiviral medicines - Ledipasvir and Sofosbuvir. Ledipasvir inhibits NS5A, a phosphoprotein that helps with replication, assembly, and secretion. Sofosbuvir is a nucleotide inhibitor of the viral RNA polymerase. Together, these drugs help prevent the spread of hepatitis C virus (HCV). Most people will be given a dose of a single pill each day for a period of 8-12 weeks. Your doctor may prescribe you a different dosage. Follow your doctor's instructions. Ledifos has a much better side-effect profile than older interferon-based treatments. The most common side effects of Ledifos as reported in clinical studies are headaches, tiredness, and loss of appetite, diarrhea, insomnia and nausea. More severe side effects may display as signs of allergic reaction (eg. rash, hives, excessive itching, unusual difficulty breathing, tightness in your chest, or swelling of the mouth, face, lips, or tongue) or cardiovascular problems. If you notice any of these, seek medical attention immediately and stop taking Ledifos. 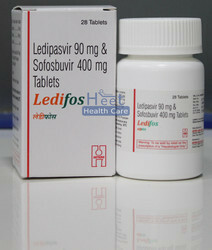 Ledifos (Ledipasvir/Sofobuvir) has a very high cure rate and is an ideal treatment for most hepatitis C patients. There are however, some situations where you should not take Ledifos. If any of the above apply to you, you may still be able to take Ledifos, but should discuss the possibility of different treatment this with your doctor before beginning treatment. 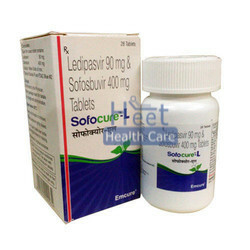 Sofocure L (Ledipasvir and sofosbuvir) is a combination of 2 hepatitis C virus (HCV) antiviral agents. It reduces the amount of HCV in the body by preventing the spread of the HCV within the body. Ledipasvir is a potent inhibitor of HCV NS5A, a viral phosphoprotein that plays an important role in viral replication, assembly, and secretion. Sofosbuvir is a nucleotide analog inhibitor of hepatitis C virus NS5B polymerase the key enzyme mediating HCV RNA replication. The triphosphate form of sofosbuvir (GS-461203) mimics the natural cellular uridine nucleotide and is incorporated by the HCV RNA polymerase into the elongating RNA primer strand, resulting in viral chain termination. Sofocure L (Ledipasvir-sofosbuvir (90 mg/400 mg)) is a fixed-dose combination tablet. The recommended dosage is one tablet once daily, with or without food. · Tell your doctor or dentist that you take Sofocure L (ledipasvir and sofosbuvir) before you receive any medical or dental care, emergency care, or surgery. SOFAB LP is a combination of two hepatitis C virus (HCV) antiviral drugs in a single form. Each single tablet contains ledipasvir and sofosbuvir. SOFAB LP is a combination of ledipasvir and sofosbuvir and is used to treat chronic (long-lasting) hepatitis C, a viral infection of the liver. It may sometimes be used with another antiviral medication (ribavirin). These drugs work by reducing the amount of hepatitis C virus in your body, which helps your immune system fight the infection and may help your liver recover.